Fig 3. 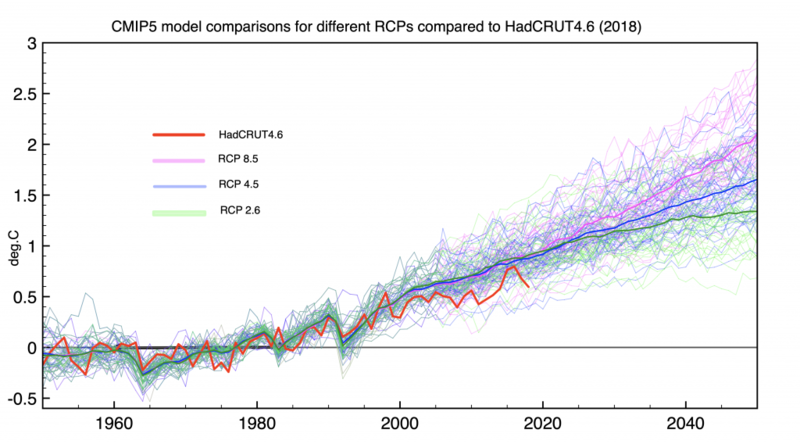 HadCRUT4.6 compared to 41 models run with 3 widely different RCP forcing. I have just finished reading the book ‘Denied’ by Richard Black, the director of the Energy and Climate Intelligence Unit (ECIU) and ex-BBC environment editor. It is well written and easy to read. He claims to demolish the climate “contrarian” and climate “denier” positions on climate change and renewable energy. As far as I can work out contrarians are lukewarmers who accept the science but argue that any future warming will be far less damaging than the consequences of overreacting to it right now, while ‘deniers’ argue that CO2 can have no effect on the climate at all. His main targets in the book are the usual suspects: the GWPF, Nigel Lawson, Matt Ridley, Christopher Brooker, James Delingpole, Judith Curry and anyone else who dissents from mainstream climate and green energy orthodoxy. Richard is also upset with the BBC for interviewing Nigel Lawson on the Today programme, and with various newspapers for giving Brooker, Delingpole or David Rose any column space. In this vein then I too should be placed in the Contrarian camp, particularly concerning renewable energy policy. Warming has continued as expected and the pause never actually happened. 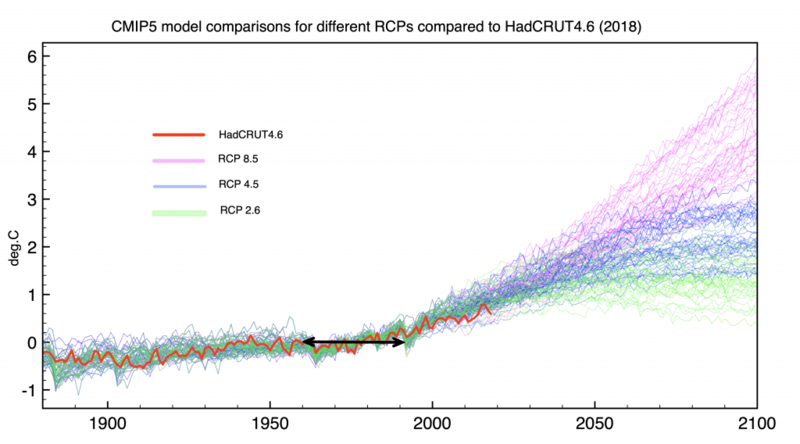 Temperature data are now compatible with model ‘projections’. Prices of new off-shore wind capacity and of solar panels have dropped so dramatically that they are competitive or cheaper than Nuclear and Gas. So objecting to green energy is illogical. The new SR15 report has highlighted the need for immediate action to close down fossil fuels as soon as possible and invest in ‘clean’ energy. Shale Gas is an illusion. Let’s look at each claim in turn. The Pause is no more. Here is the original plot from AR5 showing a comparison of four major temperature datasets versus CMIP5 model projections. In 2012 all the major temperature sets (HadCRUT, GISS,NCDC) showed no consequent year warmer than the El Nino year 1998. 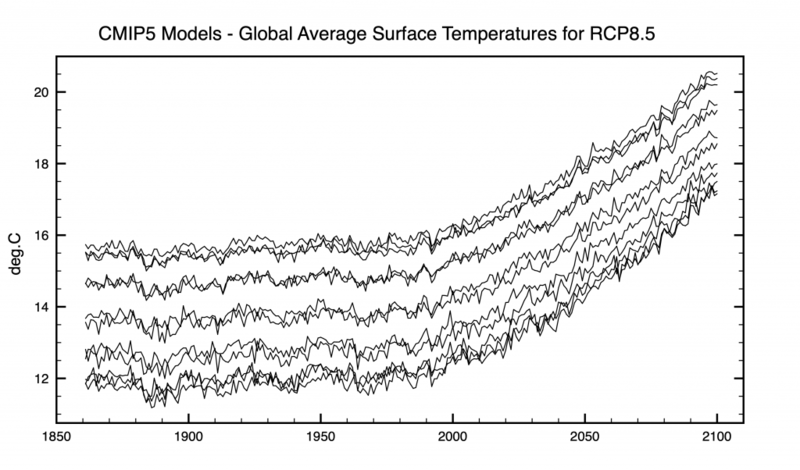 Furthermore the trend was dropping below model predictions. Since then a huge effort has been made to add new weather stations in Arctic regions where warming is fastest and to improve the spatial coverage averaging. Fig 2. How the pause ‘disappeared’ . HadCRUT4.6 has about 2000 more stations than HadCRUT3 had in 2012, but also dropped some stations in S. America (they were cooling). Temperature homogenisation on land and oceans has also had a net warming effect, although quite why seems to be a bit of a mystery. 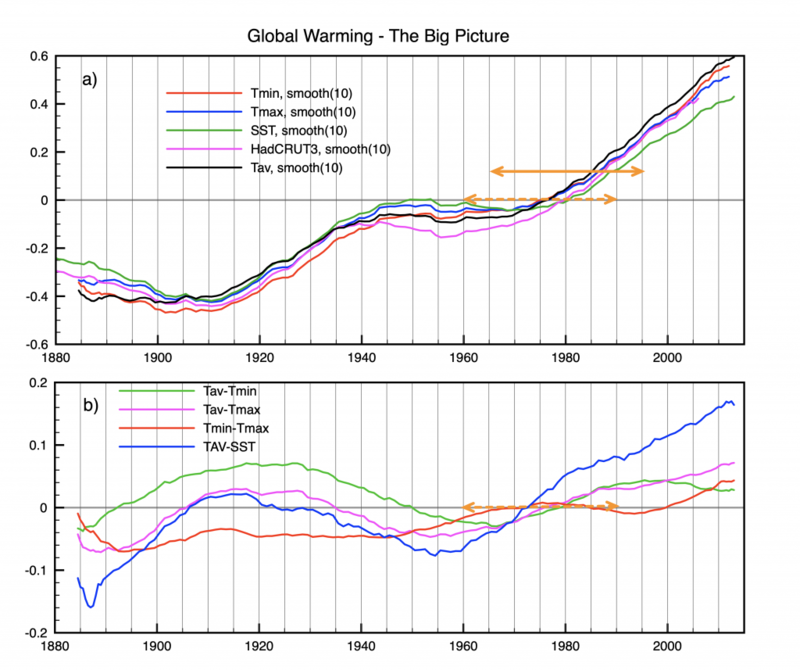 The method of spatial averaging also has an important net effect on the global temperature. Cowtan & Way used kriging to infill empty regions, whereas I use a 3D spherical triangulation to provide natural global coverage. The results are almost identical. What is interesting though is that the flat trend prior to 2014 has now disappeared in HadCRUT4.6 which uses the same averaging procedure throughout. So this must be due to ongoing data corrections and to all the new stations added consequently. Each new monthly release of data shows that earlier values of global temperatures also get updated. Data homogenisation is a continuing process updating past measurements as well as new ones. Note however that temperatures have been falling for the last two years following the the 2016 El Nino peak. If 2019 continues this cooling trend then the pause or hiatus in warming could well return. 2. Falling prices of renewable energy. 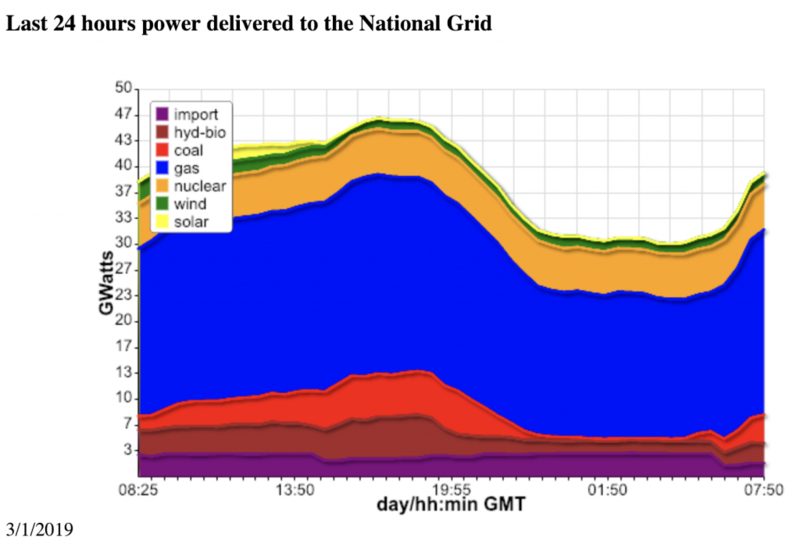 Solar Energy makes little sense in Britain because it produces no power in winter. Annual peak demand is around 5pm during winter evenings when solar output is zero. So if energy security is your goal then solar power is useless no matter how cheap the price falls. The only thing going for it is that it can displace fossil generation during summer months thereby reducing CO2 emissions if that is the goal, but this then increases the overall energy cost. 3. Urgent action to avoid climate disaster. How realistic is it to expect the world to cut carbon emissions in half by 2030 and eliminate them by 2050 to meet the 1.5C target? If we get it wrong by acting too soon then we don’t get a second chance because we destroy our economies in the attempt. David Mackay said we need a plan that works for the UK. Similarly each country needs a plan that works for its particular environment. To get to zero carbon we also have to electrify both transport and heating. This means that electricity peak demand will increase to a minimum of around 90GW. The problem then is that this increased demand must be reliably met on cold winter evenings or people will die. Does Richard Black imagine that by expanding wind power alone one could achieve this goal, or that somehow battery storage might cover such wind lulls ? Last night is a good example of the problems we already face after installing well over 20GW of wind capacity and over 30GW of solar capacity. Renewables simply cannot provide energy security. Nor can some magic smart grid or energy storage system cover several day long wind lulls affecting Northern Europe each winter. So given that we must provide power 24/7 to maintain modern life then the only realistic low carbon solution is nuclear power. Roughly 30 identical Hinkley sized nuclear plants would do the job nicely. I doubt whether Richard Black nor his ECIU would agree with that. I wonder who might eventually be called an energy denier?